CHRYSLER GRAND VOYAGER in years 2008-2012. LANCIA VOYAGER (PHEDRA) in years 2011-2012. due to weather conditions and many other factors. UKMAINLAND ONLY, ASK for the price for off-shore locations such as. CHRYSLER PT CRUISER. CHRYSLER (DODGE) NEONin years 1995- 2005. due to weather conditions and many other factors. Also ASK for Northern Ireland, parts of Scotland such as Highlands, Inverness-Shire etc. Due to weather conditions and many other factors. Also ASK for Northern Ireland, parts of Scotland such as Highlands, Inverness-Shire etc. CHRYSLER PT CRUISER. CHRYSLER NEON. This is a HIGH QUALITY set of REAR brake discs and pads for Channel Islands, Isle of Man etc. BEFORE YOU BUY as the price could vary. due to weather conditions and many other factors. MADE BY MORSE, LEADING US MANUFACTURER. (MORSE FRICTION MASTER IS PART OF BOSCH GROUP). CHRYSLER CROSSFIRE in years 2004 - 2008. due to weather conditions and many other factors. Also ASK for Northern Ireland, parts of Scotland such as Highlands, Inverness-Shire etc. CHRYSLER VOYAGER & GRAND VOYAGER in years 1996-2007. due to weather conditions and many other factors. Channel Islands, Isle of Man etc. BEFORE YOU BUY as the price could vary. Due to weather conditions and many other factors. BT, KW, IV, PH, HS, KA, ZE, PA, AB and OBAN. Also ASK for Northern Ireland, parts of Scotland such as Highlands, Inverness-Shire etc. CHRYSLER VOYAGER& G. due to weather conditions and many other factors. UKMAINLAND ONLY, ASK for the price for off-shore locations such as. Also ASK for Northern Ireland, parts of Scotland such as Highlands, Inverness-Shire etc. CHRYSLER GRAND VOYAGER in years 2008-2014. - LANCIA VOYAGER in years 2011-2014. 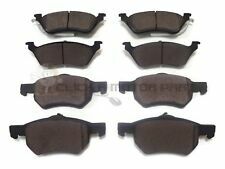 SET of FRONT CERAMIC brake PADS for due to weather conditions and many other factors. Also ASK for Northern Ireland, parts of Scotland such as Highlands, Inverness-Shire etc. CHRYSLER GRAND VOYAGER. REAR BRAKE PADS. GRAND VOYAGER. JEEP CHEROKEE, WRANGLER. FRONT BRAKE PADS. DODGE DURANGO, in years 2007-2009. -DODGE DAKOTA, in years 2005-2010. DODGE TRUCK. V8-4.7L F/inj. (16V) SOHC Flex Fuel (P) [2010-2009]. Flex Fuel EVD (P) . Ram 1500 Pickup - 1/2 Ton. SOHC Flex Fuel (N) . Made by NEWTEK. due to weather conditions and many other factors. BT, KW, IV, PH, HS, KA, ZE, PA, AB and OBAN. Also ASK for Northern Ireland, parts of Scotland such as Highlands, Inverness-Shire etc. Part Number : ADA104235. Model : Voyager. Make : Chrysler. Fitting Position : REAR. Body : MPV. Thickness(mm) : 15,9. Witdh(mm) : 155,7. Height(mm) : 49,4. Part Number : ADA104259. Model : Voyager Grand Voyager. Make : Chrysler. Mark/Series : (2008-). Fitting Position : REAR. Body : MPV. Witdh(mm) : 116,7. Height(mm) : 52,7. DODGE AVENGER in years 2007-2011, with 302mm rear brake discs (brake code BRF). CHRYSLER SEBRING in years 2007-2011, with 302mm rear brake discs (brake code BRF). DODGE CALIBER in years 200(6)7-2011, with 302mm rear brake discs (brake code BR1). JEEP WRANGLER (JK) in years 2007-2017. due to weather conditions and many other factors. Also ASK for Northern Ireland, parts of Scotland such as Highlands, Inverness-Shire etc. Channel Islands, Isle of Man etc. CHRYSLER NEON. due to weather conditions and many other factors. Channel Islands, Isle of Man etc. BEFORE YOU BUY as the price could vary. Chrysler grand voyager RT in years 2008-2012. due to weather conditions and many other factors. BT, TR, KW, IV, PH, HS, KA, ZE, PA, AB and OBAN. Also ASK for Northern Ireland, parts of Scotland such as Highlands, Inverness-Shire etc. Manufacturer: Chrysler. Part Number: V1013152AB. CHRYSLER 300C in years 2005 - 2012. due to weather conditions and many other factors. BT, KW, IV, PH, HS, KA, ZE, PA, AB and OBAN. MADE BY LPB. - CHRYSLER GRAND VOYAGER in years 2008-2013. due to weather conditions and many other factors. Channel Islands, Isle of Man etc. BEFORE YOU BUY as the price could vary. UKMAINLAND ONLY, ASK for the price for off-shore locations such as. DODGE RAM1500 PICK-UP in years 2003-2010 - models with 5-lug wheels except - RAM1500 in years 2011-2014. due to weather conditions and many other factors. This a HIGH QUALITY, set of (4) REAR NEWTEK CERAMIC BRAKE PADS for - CHRYSLER GRAND VOYAGER RT in years 2008-2014. due to weather conditions and many other factors. Channel Islands, Isle of Man etc. CHRYSLER 300M in years 1999-2004. -CHRYSLER CONCORDE in years 1998-2004. CHRYSLER INTREPID. DODGE INTREPID. -CHRYSLER LHS in years 1999-2001. due to weather conditions and many other factors. Channel Islands, Isle of Man etc. CHRYSLER PT CRUISER in years 2001-2008. CHRYSLER NEONwith2.4L DOHC engine turbo HO in years 2004-2005. due to weather conditions and many other factors. BT, KW, IV, PH, HS, KA, ZE, PA, AB and OBAN. DODGE RAM1500 PICK-UP in years 2002-2005 excl. - DODGE RAM1500 VAN 2003. THE HIGHEST QUALITY ATE PREMIUM ONECERAMIC FRONT brake pads for - DODGE DURANGO 4WD 2003-2006. due to weather conditions and many other factors. JEEP WRANGLER (JK) in years 2007-2012. CERAMIC brake PADS for due to weather conditions and many other factors. UKMAINLAND ONLY, ASK for the price for off-shore locations such as. Part Number: CNCGX382AA. Manufacturer: Chrysler. DODGE CALIBER in years 200(6)7-2013 with 262mm rear brake discs. DODGE AVENGER in years 2007-2011, with 262mm rear brake discs (brake code BRG). CHRYSLER SEBRING in years 2007-2011, with 262mm rear brake discs (brake code BRG). CHRYSLER CROSSFIRE. REAR BRAKE. GENUINE NEW. ISLE of MAN / WIGHT. ALL ZE CODES. PH4 - 41, 49 - 50. PA20 - 38, 41 - 49, 60 - 78. IV1 - 28, 30 - 32, 36 - 48, 51 - 56, 63. 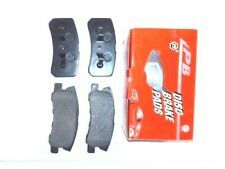 Chase Brake Pad Set. Warranty: A 12 Month Warranty is standard on all products. Part Number: V4010871. Manufacturer: Chrysler. Part Number : ADA104204. Model : Voyager. Make : Chrysler. Body : MPV. Fitting Position : FRONT. Quantity : 1 Set (4). Height(mm) : H1:72,5;H2:69,3. Engine Size : 2.8. Part Number: 77367213. Manufacturer: Chrysler. See photo's for more information. You will receive the part shown in our photos. Part Number : ADA104358. Model : Voyager. Pitch Circle : 127. Make : Chrysler. Body : MPV. Fitting Position : FRONT. Minimum Thickness(mm) : 26.4. Disc Thickness(mm) : 28. Part Number : ADC44241. Model : Sebring. Make : Chrysler. Fitting Position : REAR. Body : Convertible. Thickness(mm) : 15,5. Witdh(mm) : 107,8. Height(mm) : 41. Part Number : ADC44243. Model : Sebring. Make : Chrysler. Fitting Position : REAR. Body : Convertible. Thickness(mm) : 15,5. Witdh(mm) : 107,8. Height(mm) : 41. Part Number : ADA104213. Model : Voyager Grand Voyager. Make : Chrysler. Mark/Series : (2008-). Body : MPV. Fitting Position : FRONT. Quantity : 1 Set (4). Engine Size : 3.8.